Social Welfare professor Bridget Freisthler released a study July 18 examining how marijuana use and the concentration of marijuana dispensaries in a given area contribute differently to child abuse or neglect. Freisthler and her co-authors Paul J. Gruenewald and Jennifer Price Wolf, of the Prevention Research Center at the Pacific Institute for Research and Evaluation, examined the relationship between this increased availability of marijuana and its correlation with abusive and neglectful parenting. In addition to her research, Freisthler leads the Spatial Analysis Lab in the department of social welfare and the Child Abuse and Neglect Social Ecological Models Consortium. This project is funded by grant number P60-AA-006282 from the National Institute on Alcohol Abuse and Alcoholism and grant number R01-DA032715 from the National Institute on Drug Abuse. Social Welfare professor Bridget Freisthler released a study on March 24 examining how various drinking habits contribute differently to child abuse or neglect. In the past, Freisthler has studied how accessibility to alcohol is related to crime and child abuse, as well as how services can reduce these effects. According to a national study, alcohol is a factor in more than 11 percent of child neglect cases, but little is known about how alcohol use is related to neglectful parenting. Neglect is defined by federal legislation as failure to give minimum care that meets a child’s physical needs or is failure to take precautions to ensure child safety in and out of the home. Most research on this subject has focused on alcohol dependence, abuse and quantity consumed, not on drinking frequency or contexts. Freisthler and her co-authors Jennifer P. Wolf and Michelle Johnson-Motoyama attempted to fill this gap by examining five different drinking contexts and how it does or does not contribute to child neglect. The study found that frequency of drinking (how often a person drinks), but not volume of drinking (how much he or she drinks), is related to higher likelihood of supervisory neglect, but lower likelihood of physical neglect. In other words, frequent drinkers are more likely to fail to provide adequate care for their children. Heavy drinkers, on the other hand, are more likely to leave their child unsupervised at home or in a car. The social contexts in which parents drink each played distinct roles in child neglect, according to the study. Those who drank more often with friends, for instance, were more likely to leave their children home alone during the past year, while drinking with family was instead more positively correlated with unsafe monitoring of children. Interestingly, frequency and continued volumes of drinking in any context were not found to be related to parents’ reports of insufficient food or heat in the house. Freisthler’s findings are significant, especially during National Child Abuse Prevention Month, because it urges researchers, communities and social workers to look more deeply into the social mechanisms behind child abuse and neglect. Freisthler and her co-authors suggest future studies to understand the temporal relationship between drinking and neglect as well as more close examinations of parents’ routines and patterns to discover the nuanced interactions between alcohol consumption and neglect. 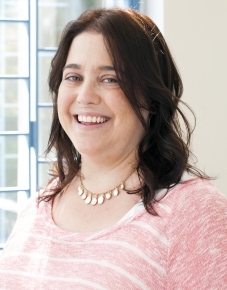 In addition to her research, Freisthler leads the Spatial Analysis Lab in the department of social welfare and the Child Abuse and Neglect Social Ecological Models Consortium. The drinking study is funded by NIAAA grant number P60-AA006282. Counseling, Parenting Classes Are Most Requested Services in Child Welfare System Bridget Freisthler releases research brief on her "Needs Portal" utilized by DCSF. Social Welfare Professor Bridget Freisthler and the UCLA Spatial Analysis Lab recently released a research brief analyzing user data for Freisthler’s “Needs Portal” program. Freisthler and her team of doctoral students created the Needs Portal for the Los Angeles County Department of Children and Family Services (DCFS) in order to provide an online real-time service linking case workers to agencies willing to offer requested resources. Prior to the development of this program, families involved in child welfare would receive a print brochure of available agencies, information which would quickly become outdated with any change in the listed agencies. With the Needs Portal, caseworkers can instantly access updated information on the closest agencies, post requests for specific needs by opening “tickets”, and link families to a list of available service providers. Regardless of experience and their personal knowledge of agencies, caseworkers can now use the portal to access a database of information not widely available to social workers before. The research brief released April 7 analyzed the Needs Portal’s usage through a census of service request tickets that were closed by February 28, 2015. The results were divided into three overall service categories: Psychosocial, Basic Needs, and Well-Being services. The results show that caseworkers made the highest number of requests for Psychosocial services through the Portal and, in turn, received the most comments from willing service providers. This stands to reason that the most traditionally recognized needs of those in the child welfare system are psychosocial. Results from the Basic Needs category landed in the middle, with the second-highest number of requests and comments, though housing requests received a much lower number of agency responses. Case workers made the least number of requests and received the least comment responses in the Well-Being category, despite the fact that these services may offer more long-term benefits for family development and self-sufficiency. These data results will help the pilot program continue to improve and expand in order to reach more social workers and families in the future. Freisthler’s Needs Portal project was highlighted in greater depth in the summer 2014 issue of the Luskin Forum. UCLA Medical Marijuana Research Team Releases Brief On Dispensaries The team examined the changes in the number and location of medical marijuana dispensaries in the city of Los Angeles. 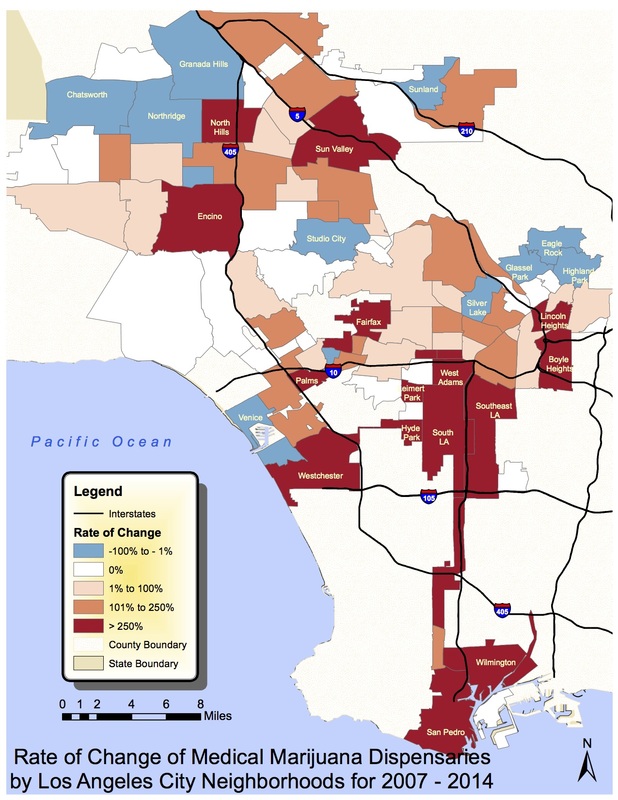 The UCLA Medical Marijuana Research team led by Social Welfare professor Bridget Freisthler recently released a brief that examines the changes in the number and location of medical marijuana dispensaries in the city of Los Angeles over a seven year time period. The brief illuminates the prevalence of medical marijuana dispensaries in the city. In 2007, Los Angeles had 187 open and operating dispensaries but by 2014 the number had reached 418. This finding could have implications on the monitoring of dispensaries. In 2013 voters passed Proposition D, a city ordinance that would, in part, limit the number of medical marijuana dispensaries allowed in the city to 135. Despite this ordinance, Freisthler’s research showed that the city currently has over three times that limit as of 2014. The research also showed a shift in distribution of dispensaries across the city, moving “from the San Fernando Valley and East L.A. to the South L.A. and San Pedro areas”. The map shows the rate of change of medical marijuana dispensaries in the city from 2007 to 2014. While some neighborhoods saw a decrease in dispensaries, the rate of change in others, like South LA and San Pedro, increased over 250 percent. The large increase in dispensaries in San Pedro could also be a result of cause and effect. As dispensaries were being shut down in Long Beach “due to increased enforcement, dispensaries migrated to San Pedro,” Freisthler says. The study was funded by the National Institute on Drug Abuse and led by Dr. Bridget Freisthler, Principal Investigator, with Dr. Paul J. Gruenewald, Co-Investigator; Crystal Thomas, Graduate Student; Alexis Cooke, Graduate Student Researcher; and Alex Creek, Student Researcher. The UCLA Medical Marijuana Research team was initiated as a way to examine how the emergence of dispensaries change the ecological landscape of the neighborhoods in which they are located, including changes in crime and dependence. The research team hopes to provide communities with guidance on regulatory processes that may improve neighborhood problems related to dispensaries. Social Welfare professor Bridget Freisthler was recently mentioned in an article for her expertise on alcohol and abuse. Part of Freisthler’s research is based on substance use and related problems, and child abuse and neglect. In the article titled, “South LA liquor stores may put residents’ health at risk” published by Intersections South LA, reporter Morgan Greenwald discussed the correlation between liquor stores and the detrimental effects it causes on communities. South L.A. has one of the highest density of liquor stores with 150 liquor stores and one of the highest car accidents rates involving alcohol in the country. A study in the county showed that an increase in alcohol-related motor vehicle crashes correlated with the number of liquor stores in the area. The article references Professor Freisthler’s research on the effect that access to alcohol has with violence, “places that have higher densities of outlets have increases in violence, child abuse and neglect [and] traffic crashes,” said Freisthler. Many organizations in the community are getting involved to decrease the liquor store density in hope of closing stores that contribute to the cycle of crime and addiction. Regulating marijuana delivery services could help address recreational use New study from Social Welfare professor Bridget Freisthler surveyed almost 9,000 users in 50 California cities. Banning medical marijuana dispensaries or regulating their number and density in a given city may not be sufficient to lower marijuana use if delivery services open in their place, according to UCLA research. The new study, led by UCLA social welfare professor Bridget Freisthler and co-authored by Paul Gruenewald of the Pacific Institute for Research and Evaluation, compares self-reported marijuana use by almost 9,000 people in 50 California cities where medical marijuana is available through storefront dispensaries and delivery services. The study’s authors say the results can help lawmakers understand how regulatory practices affect marijuana use across cities. California allows marijuana use for medicinal purposes but gives regulatory control of dispensaries to local jurisdictions. But, Freisthler said, despite heightened interest from public health researchers and an emerging understanding of statewide policies, little is known about how access to marijuana through dispensaries corresponds to patterns of use on a city-by-city basis — and whether marijuana legalization is actually leading to greater use. A key finding from the study was that people in cities with greater availability of medical marijuana — as measured by the density of dispensaries and delivery services — reported more current marijuana use and more frequent use. In addition, the number of storefront dispensaries in a community was more closely related to frequency of marijuana use than the availability of delivery services was. “The relationship between the physical availability of marijuana and the number of medical and recreational users could suggest a supply-and-demand relationship in which dispensaries and delivery services are opening in locations with higher demand,” said Freisthler, a faculty member at the UCLA Luskin School of Public Affairs. Researchers also found that 18- to 29-year-olds were more likely to use marijuana currently and frequently than any other age group, which suggests that that concerns about young people’s access to marijuana may be warranted. The study was published Sept. 2 in Drug and Alcohol Dependence. It was funded by the National Institute on Drug Abuse.